The River Kirkaig and its sister river the Inver offer wild and unspoilt salmon and sea-trout fishing across a number of private double banked beats. Rentals can be for a single day or for longer periods of time and please get in contact with the office for bookings. The Kirkaig flows through magnificent country and fishers cast with backdrop of the mountains of Suilven Canisp and Ben More Assynt. 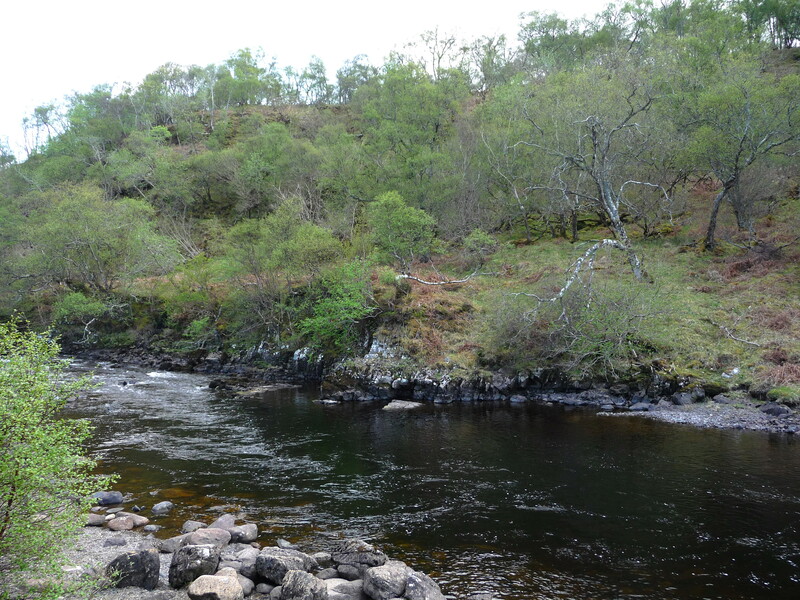 The river lies in a wonderfully unspoilt gorge with a series of rocky pools and runs. 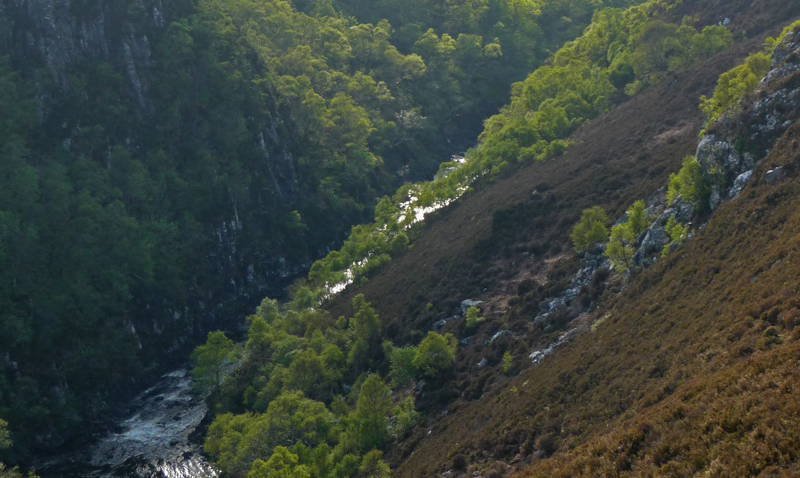 The Falls of Kirkaig, two miles upstream from the mouth are an impressive barrier to the further upward migration of salmon and sea trout, and the river below this is divided into three beats, each of two rods, which are fished on a daily rotation. Each beat has a variety of excellent holding pools, some of which are rocky and only accessible to the most agile. 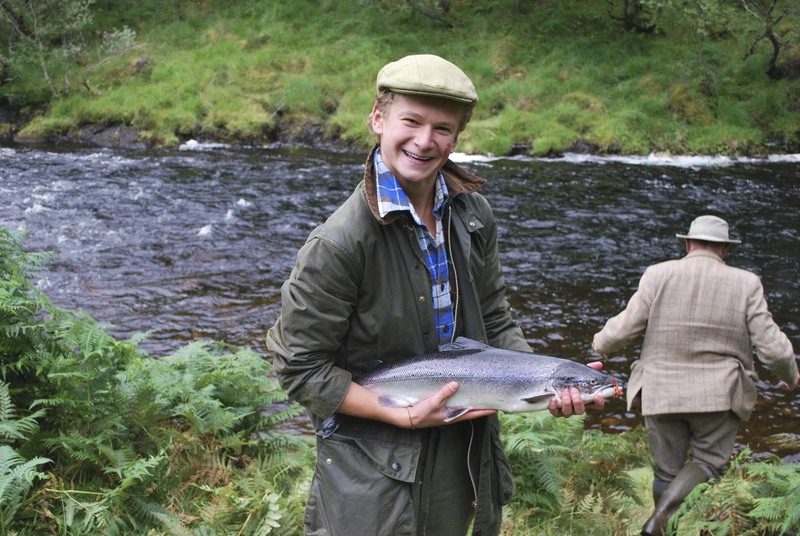 The Kirkaig is very much a spate river, and restricted to fly only with the season running from 11th February – 15th October, the main fishing months being July – October. Located just outside the small town of Lochinver, around 30 miles from Ullapool. 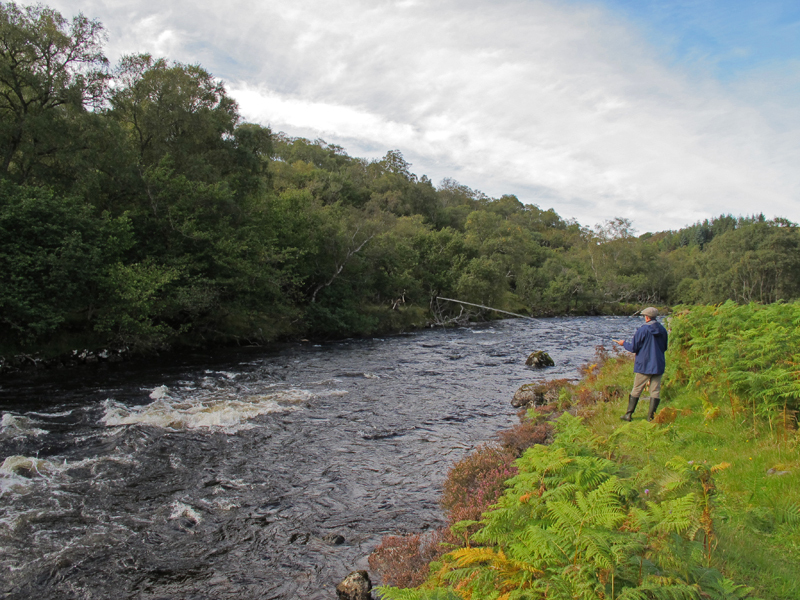 These notes on the Kirkaig are primarily for the angler who does not know the Kirkaig river and would like to try his luck on this beautiful water. There are three wonderful 2 rod beats and these notes will give you a flavour of the river and its pools. The first fish enter the river around March, and then only odd fish keep entering the river, when conditions are favourable, until June. The main run of fish usually come into the river in July, but if there is a big flood in the latter half of June a run of fish will go up the river. Fish keep entering in August and September, and it is quite common to catch fresh fish on the lower and middle beats in October. Some very heavy fish occasionally enter the river, but due to the small size of the pools and the swiftness of the current it is difficult to hold them and they usually break the cast. Fish in the teens of pounds are quite common, and over thirty pounds, by no means rare. However the average weight is about 8 lbs. 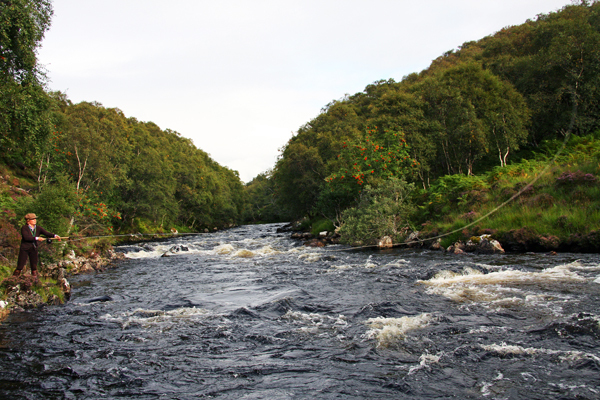 Fishing of the River Kirkaig is restricted to the right Bank throughout its length. 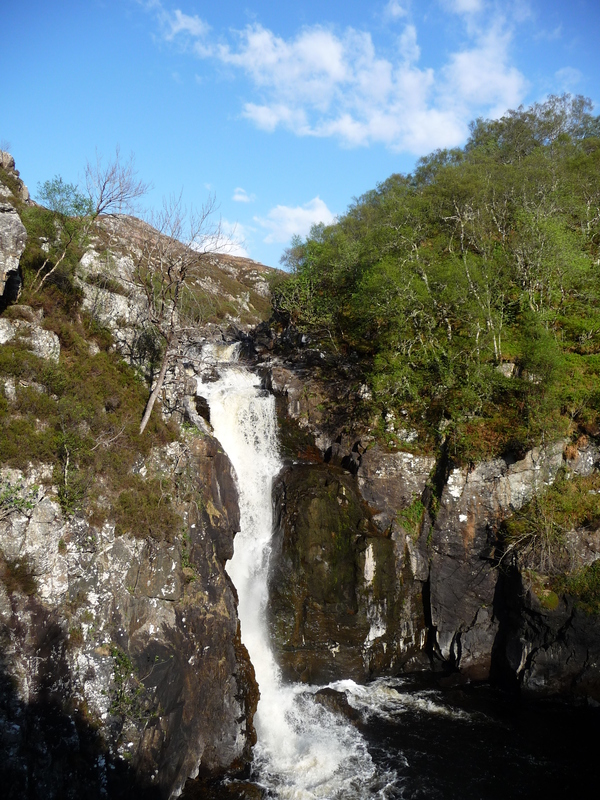 To the top of this beat, the Kirkaig Falls, is approximately two miles walk from where one leaves the car at Kirkaig Bridge. The beat is very steep, and should not be attempted by anyone unsteady on their feet. In heavy water it is impossible to follow down the side of the river in all places, and great care should be taken at all times. It is not a place for young children. The Big Falls pool should not be fished unless accompanied by another person, as it requires two people to land a fish.As with other beats this beat is best fished from top to bottom, as by walking along the river bank upstream one disturbs the fish. A very good beat, the top pool approximately one mile from the car park. Not so precipitous as the Upper Beat, and not so dangerous. Often the first salmon comes from this beat and is a grand taking beat when fresh fish are running up the river. Very accessible as many pools are beside the road. A good beat in medium to high water, but suffers in low water from tourists, picnicking and splashing about. – Inver Lodge Hotel, a convenient and very comfortable place to stay in Lochinver with the famous Albert Roux Restaurant.